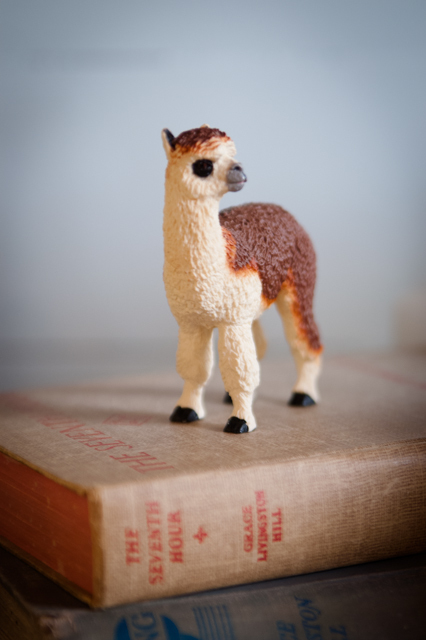 In honor of Felix's travels in Peru I brought home this plastic alpaca from the toy aisle. With his happy face and big eyes, he reminds me somewhat of Felix . . . . I hope and trust that Felix and Clara are doing well in their current adventures, my best to you and the rest of the family too. That's sweet! I hope Felix is learning and experiencing many new adventures. A sentimental mother - the proper kind! When I was small, my mother had to go in the hospital and she remembered my big eyes, I guess. She later bought a "painting" - cheap thing from the department store of a big-eyed little girl in a chair. It reminded her of how badly she felt at leaving me. I was just getting worried about Rose - now I don't have to be. Oh, my -- it's on one of my favorite GLH books. "Totes adorbs," as the young people say.